A neighborhood inspired by nature, community, and innovation. Highly efficient, economical and safe homes, nestled among 32 acres creating a community that is beautiful and healthy to live in. A two-level four bedroom and two and a half bath home coming soon. This home is built with innovative ICF construction. Make this home uniquely yours. With your home at Pringle Creek, you become part of a neighborhood founded on principles of sustainability. We offer build-ready lots, custom home plans, and a selection of newly constructed homes, all developed to the highest build quality and green certifications. You will enjoy all the modern amenities of urban living in a beautiful natural setting filled with thoughtfully planned outdoor spaces, walking and biking paths, gardens and orchards, and community gathering places right outside your front door. Pringle Creek Community is a place for everyone where the focus is on healthy living for you, your family, and the planet. 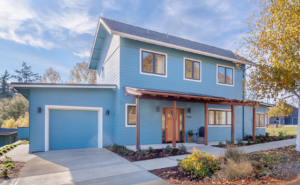 Take a virtual tour of the Net Zero home on 1758 John Muir Circle SE.